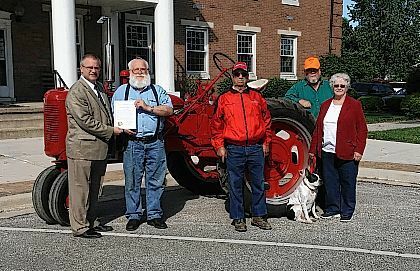 Greenville Mayor Michael C. Bowers, left, presents a proclamation to Von Oswalt, president of Greenville Farm Power, May 13, in honor of the 16th anniversary of Farm Power of the Past, which will be held this year July 9-12. Also accepting the proclamation are Gerald Brehm, Bill Young and Barb Young, on behalf of Greenville Farm Power, while Buster provides the canine companionship. The group earlier received a proclamation from the Darke County Commissioners.